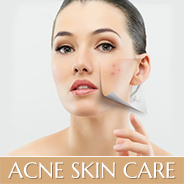 Maybe you are one of those who has an acne problem or just a break out from time to time. Which ever category you fall into, if you want to get rid of the acne, you need to be more cautious of the makeup that can cause acne cosmetica and worsen the existing acne. So, just because a product says “oil-free”, “healthy skin”, or “acne solutions”, that doesn’t mean that it is a safe choice for acne prone skin. I would be happy to provide a pore-clogging ingredients list to those acne-prone clients who want to be more diligent about their cosmetica product purchases.